Preheat oven to 350F. Line standard muffin tin with paper cupcake liners. Combine flour, baking soda, and sugar then set aside. Heat butter until soft; mix in milk, eggs, vanilla, honey and ginger, and elderflowers. Gently beat the mixture until smooth. Combine all ingredients, whisk or beat on low speed. Divide the batter evenly between the cupcake liners. Bake at 350degrees for 10 to 15minutes, or until toothpick inserted into the center comes out clean. 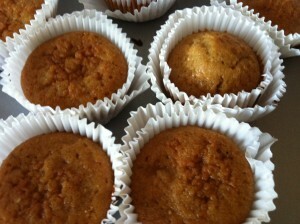 Cool muffins for 10minutes and then transfer to a cooling rack. Enjoy! Reduces nausea, used for colds, and digestion problems, fluid retention. Sheng Jiang is spicy and warm, it is mild in aroma and flavor. Used primarily to induce sweating and expel pathogens. It has a rapid but short acting effect. Dried Ginger (Gan Jiang) is spicy and hot, with a strong aroma, but mild flavor. It is warming and disperses internal cold. It has a longer lasting effect than fresh ginger (Sheng Jiang). The flower portion of the tree has a strong antiviral effect, can help with cold sores, and is generally considered an anti inflammatory. It eliminates fluids and activates the immune system. The teas made from this flower are also used to treat asthma and allergies. Thanks Julie for sharing this recipe! This entry was posted on Monday, January 14th, 2013 at 11:12 pm	and is filed under Anti-Inflammatory, Flower Remedies, Sweet Treats. You can follow any responses to this entry through the RSS 2.0 feed. You can leave a response, or trackback from your own site. The idea of a desert or snack being anti-infalmmatory definately appeals to me! I loked these muffins. I’m interested in elderflowers and berries as my friend has been making herbal wines with them and has a good source for them. When I hear elderflower I immediately think of wine. I would have never thought of putting them in muffins!